"RisohEditor" is a free resource editor for Win32 development, created by Katayama Hirofumi MZ. RisohEditor realized the ideal of resource editor. "Risoh" means "ideal" in Japanese. RisohEditor can add, edit, extract, clone and remove the resource data in EXE/DLL files. You can edit Windows resources (Dialogs, Menus, Icons, Cursors, String Tables, Message Tables etc.) by using RisohEditor. 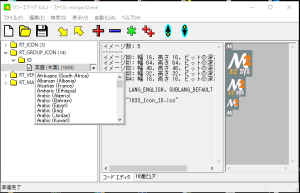 This software is multilingal (English, Chinese, Italian and Japanese). NOTICE: Please avoid installing in "C:\Program Files" or "C:\Program Files (x86)". Because the resource compiler (windres) doesn't accept space character in the file path. Full Unicode support (for international resources). It can read the "resource.h" header file. The exported resource can be read by Visual C ++ 2017. It works on Windows XP/2003/Vista/7/8.1/10 and ReactOS. You can download from Softpedia. Fix the file types on extraction. Write dagger to source file to help UTF-8 detection. Split the RT_DIALOG and RT_MENU resource templates in languages. Improve "String Entry" dialogs (multiline). Check file lock on saving a file. Make resource IDs case sensitive. Support encoding of resource items. Fix the abnormal termination at "Languages" dialog. Accept space in the caption text box. Accept space in the language text box. Accept space in the window class name text box. Accept C string literal in the window class name text box. Correctly display ID types of "List of Resource IDs". Correctly sort the languages upon output. Fix "List of Resource IDs". Don't use WS_EX_MDICHILD extended style. Fix "Clone In New Language". Add PBS_MARQUEE and PBS_SMOOTHREVERSE styles. Fix the process of compilation error. RisohEditor is a freeware that was released under GPLv3. This software was created by using the MZC4 Class Library. There is RisohEditor's source at GitHub. Bug reports, improvement suggestions, and internationalization are welcome. You can send e-mail to katayama.hirofumi.mz@gmail.com .